Are you Fearful of Market Crash? Its time to be Greedy! Since beginning of 2018, we have seen severe correction in broader indices. As on date, BSE Small Cap & BSE Mid Cap Index is down by 28.5% & 19.1% respectively from their all time high made in January this year. Steep fall in broader indices have hurt sentiments and created panic for many of retail investors who got into market last year or during this year. Its important to know, whether you would be able to hold on your equity investments in case stock market tanks further or think to exit? Its important to understand that long term gains come in equities with such short term pain. We have seen such a severe correction in small and mid cap stocks after 2011. With fall in stock prices during this year, valuations of many small and mid caps become attractive to reasonable. In fact, many good companies are available at valuations which look very attractive considering the earning growth these companies are expected to deliver over next 2 years. This is not the time to sell in panic, but to accumulate good companies available at discounted valuations. Moreover, once the market bottoms out and form a base, we can see renewed buying interest in small & mid caps. Bad sentiments will not last for ever, its time for long term investors (2-3 years) to start accumulating good quality stocks which after a long time are becoming available at attractive valuations. Post recent correction in small and mid cap stocks, we have reviewed all our past recommendations released under Hidden Gems and Value Picks and short-listed 6 Hidden Gems and 6 Value Picks stocks which offer good long term investment opportunity and have potential to give excellent returns on your investment during next 2 – 3 years. 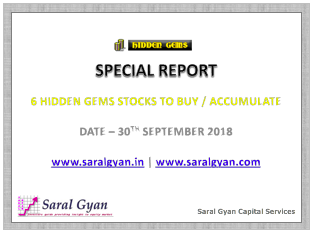 We have released our "Special Report - 6 Hidden Gems Stocks to Buy / Accumulate" on 30th Sept 2018 and mailed it to our Hidden Gems members. Similarly, we also released our "Special Report - 6 Value Picks Stocks to Buy / Accumulate" on 02nd Oct 2018 and shared it with our Value Picks members. One of the important key to successful investing is to pick the right business at decent valuations. We finalized these 12 stocks with a long term view (2-3 years) and find them superior over other Hidden Gems and Value Picks stocks in terms of valuations, earning visibility, debt management (Loan book growth, NPAs, Capital Adequacy & Other Imp Financial Ratio’s in case of NBFC / HFC) and integrity of promoters towards their business and interest of minority shareholders. The 6 Hidden Gems stocks which we finalized have a market capital below 600 crores and seen a price correction between 25% to 50% from their 52 week high without any major change in business fundamentals. We believe these stocks will outperform giving much better returns compared to broader indices in medium to long term. Our members can add these stocks in their portfolio with long term view (2 to 3 years). We suggest our members to start investing in these 6 Hidden Gems stocks with initial allocation of 2-3% and increase allocation gradually to 4-5% in staggered way in case stock prices of these companies falls by another 10% to 20% or more during ongoing market correction. The 6 Value Picks stocks which we finalized have a market capital between 500 crore to 5000 crores and seen a price correction between 40% to 48% from their 52 week high without any major changes in business fundamentals. We believe these stocks will outperform giving much better returns compared to broader indices in medium to long term. Our members can add these stocks in their portfolio with long term view (2 to 3 years). We suggest our members to start investing in these 6 Value Picks stocks with initial allocation of 2-3% and increase allocation gradually to 4-5% in staggered way only in case stock prices of these companies falls by another 10% to 20% or more during ongoing market correction. If you wish to receive our Special Reports - 6 Hidden Gems Stocks to Buy / Accumulate, you can subscribe to our Hidden Gems service and for our Special Report - 6 Value Picks Stocks to Buy / Accumulate, you can subscribe to our Value Picks service. To get access to both the reports, you need to opt for combo plan of both the services. If you have patience and want to add extra power in your portfolio, start investing some portion of your savings in fundamentally strong small and mid cap companies - Hidden Gems and Value Picks. Moreover, if you have invested in stocks and believe that your investments are not performing well, subscribe to our Wealth-Builder service and get your portfolio reviewed by us. We will review fundamentals of the companies you are holding and guide you which stocks to hold and which to exit. We will also review your equity investments across sectors and companies to ensure that your portfolio allocation is right and outperforms major indices giving you better returns in medium to long term. 8. Saral Gyan eBook - "How to Grow your Savings?" worth Rs. 599 for Free. Below table indicates subscription services and discounted prices valid up to 15th Nov'18.